Questioner: I am very very new with R... Is there some simple code I could just paste? Translation: Really? Isn't there anything you could suggest? Looking over the original exchange it does not look like this code would even work for a logit for which it was originally needed. However, I will post it on github and perhaps others will find the concept useful enough to make revisions (unlikely). I might take another go at making it more general in the future though in all likelihood some user will send me an angry message saying "this has already been done by ...". this helped me much, thanx for that! Good post and thanks for the function. I agree that people can often lose their humility when they attain greater knowledge and skill which obviously happens sometimes with users on R mailing lists. But then again, its also about finding a good balance. People usually gain more by solving things for themselves but sometimes they need that little bit of help to get them started. In any case, its always better to be respectful! If you want to write to an excel format rather than a csv format, see packages xlsx and XLConnect. Here's an overview, although not specific to lm: https://tradeblotter.wordpress.com/2013/05/02/writing-from-r-to-excel-with-xlsx/. Fourth answer, plus translation, is the reason why I don't care to read R-help any longer. Also, because thanks to cheap HDD space, my own stupidity would be visible for later generations, much to my embarrassement, I guess. I know prefer to bugger my colleagues, which seem to be all better in learning R and stats than me. I'm lucky to have such an environment. My supervisors and co-authors, on the other hand, are utterly useless in such a case. Yea, there's a much simpler way to do this using the R2HTML package. The package has an HTML2clip function which will format the summary output as an HTML table on the clipboard, which can be pasted into Excel. and then you just past into Excel. I had to face that problem when teaching R to social science students who do not use TeX and thus could not use the stargazer package to get their OLS results out of the console. It'd be great if the package could gain some form of CSV export (it already exports to ASCII, so even that should be parsable). I've had good luck using package xtable to format tables in html. Save that to a file and import it into Excel or print it to the console, select it and paste it into Excel. It's a shame the original questioner felt obliged to delete their question. A more useful answer would be, someone on stackoverflow might *explain* it to you, but R-help will try to make it as obscure and difficult as possible to deter 'stupid' questions. Just noticed this posted to R-bloggers. 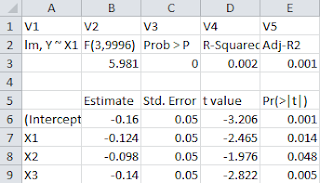 I've recently finished writing up two informal papers (for our local online magazine: Benchmarks) which deal with similar issues -- getting stuff out of R and into Excel as well as getting stuff from Excel into R...See Adobe.pdf files below. A couple things. First, like it or not, there is an "intro" to the r-help mailing lists which people are supposed to read and respect. The mailing lists are quite specifically NOT for people who have no understanding of software, which is certainly the case for the vignette you posted. Novices should learn how to program and how to use R by reading the excellent R-intro document. Frankly, the responses weren't insulting. They were blunt and to the point. If the mailing list encouraged questioners of all levels it would collapse under the weight of the posts. People really, no REALLY, need to be taught to do their own research, in this case meaning scouring the help archives for similar questions. Second, I'm a bit concerned that your example of writing from R to Excel includes massive truncation of the data. Unless you have some a priori reason to believe everyone's data are precise to only 3 places or so, why are you doing that? As for your first point. I guess I am just baffled why such a fundamental question would not have an easy answer. That are the basic features of any statistical software? 1. Import data 2. Do analysis 3. Export analysis. How much scouring really should be necessary? As for your second point. It is an option in the function to choose the number of digits to truncate. I was hoping anybody who was looking at it could figure that out pretty easy but perhaps I should have put more comments. Point One: People who ask that question need to step back and learn about the concept of software, not to mention the concept of "find the existing introductive tutorials." The original question is right up there with "Hey, how do I change the font size in Microsoft Word." Do you really believe questions like that should be asked? Point two: yes I saw your options. That's not how precision analysis works. If you are going to export data, the best thing to do by far is export as binary, i.e. precision to the limit of the source. If you must go by way of ASCII text, then always send as many digits as possible; leaving actual analysis for later. As for the primary point of me critiquing the hostile tone of the original post. It seems you are continuing expressing yourself in the same brutal tone. In addition, I don't see how it serves anybody having an R censorship board running around telling people what questions are worth asking. Fortunately, people were much kinder to me than I am guessing you would have been. I wrote a small package that attempts to write an 'arbitrary' R data structure (vector, df, matrix, list) to a CSV file in a reasonable format (list elements are written sequentially and indented according to their level in the list), using a single command, 'toCSV'. It was one of my first attempts at an R package and is probably a piece of rubbish - there is at least one bug in there that still needs fixing. Ergo, it has not been released. @cellocgw Boo to that opinion (not to you personally, but definitely to that opinion). Let's not pretend that the internet is a place where people read introductory documents before they participate. The *correct* response to any overly-simple question on R-help is "I think you'll find your answer (and more!) over at stackoverflow.com. It's easy to ask questions and many answers are already there! Good luck!" That said, even SO still has some barriers to the really new. I would love to see a sandbox area of SO where dumb/repeat/unresearched questions are not only allowed, but encouraged. Appreciated! Small typo, though: ncol twice where you refer to the created ncoll object. Note that "resultRawls" is the name of the new file I want to create. I wrote an R package called 'table1xls' for doing this and other routine Excel-exporting of formatted table. It has been available on CRAN since fall 2013, so a couple months after you wrote this post. And no, I don't belong to "The Club" either. Having to communicate with doctors, nurses, biologists, etc. on a daily basis, one must use Excel and other beasts. Using R code rather than copying-pasting each table separately, makes the communication far more reproducible.